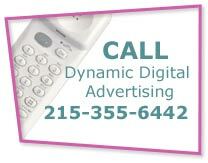 Philadelphias premier custom website design company, Dynamic Digital Advertising commits to building the type of website that can rank number-one on leading search engines such as Google, Yahoo, and MSN. Through a proprietary fourteen-step process dedicated to professional website development that uses every available tool to earn the highest possible search engine rankings, Dynamic Digital Advertising is able to launch powerful search engine-optimized websites. Included in this custom website design process are search engine optimization copywriting, advanced metrics tracking, planned architecture and navigation, website hosting, and much more. How do Promotional Calendars help my business? In the profusion of advertising campaigns that surround us every day, it is important to have the tools that will distinguish your company. Calendars make your business’s contact information accessible and, additionally, feature the unique visuals that make clients remember your products or services. With the availability of online technology, calendars can also work with corporate websites and become interactive tools rather than static displays. Wall calendars are hung in plain sight while smaller desk calendars and planners are kept handy and viewed frequently. Corporate calendars feature all the information that is placed on business cards, such your company, contacts, phone numbers, building and email addresses, and website URL. Instead of being placed in an index and forgotten a corporate promotional calendar allows your business’s contact information to be prominently displayed at all times. Some corporate calendars offer stock photographs or images. These run-of-the-mill designs allow clients to see your promotional calendar without thinking of your company. Generic pictures that are unrelated to your industry make your calendar as common as the next one. Why would a company that manufactures machine parts want their promotional calendar to feature scenic nature photographs? Worse still, calendars featuring silly or trite designs are thrown into the trash bin. Dynamic Digital Advertising works with your company to choose an effective, visually appealing design that is specific to your company and sure to make an impact with your clients. Additionally, as the first commercial digital photography studio in Pennsylvania, Dynamic Digital Advertising offers photography services to further the personalization your corporate calendar. Through in-house, state-of-the-art studio, you have access to the photography that displays the best of your business. As a pioneering digital advertising and custom website and graphic design company, DDA takes calendars to the next level. If your business has a website, Dynamic Digital Advertising’s designers can place fun facts, trivia questions, or riddles that can prompt your customers or clients to return to your website each month for answers, games, or information. The business relationship is ongoing regardless of whether you and your client are actually in the process of doing business. DDA creates a simple and active advertising tool that gets your client to pay attention year in and year out. Since 1994, DDA has lead the digital advertising industry with creative and dynamic marketing tools such as promotional calendars. Clients of Dynamic Digital Advertising, a professional custom website design company, have access to innovative solutions for Marketing in the 21st Century that include print media, graphic design, virtual reality, marketing and branding, website design and development and more. Harness the power of cutting-edge technology through Dynamic Digital Advertising to generate the business you deserve.